Form MVU-22 or the "Affidavit In Support Of A Claim For Exemption From Sales Or Use Tax For Transfer Of A Fire Engine Or Ambulance" is a form issued by the Massachusetts Department of Revenue. 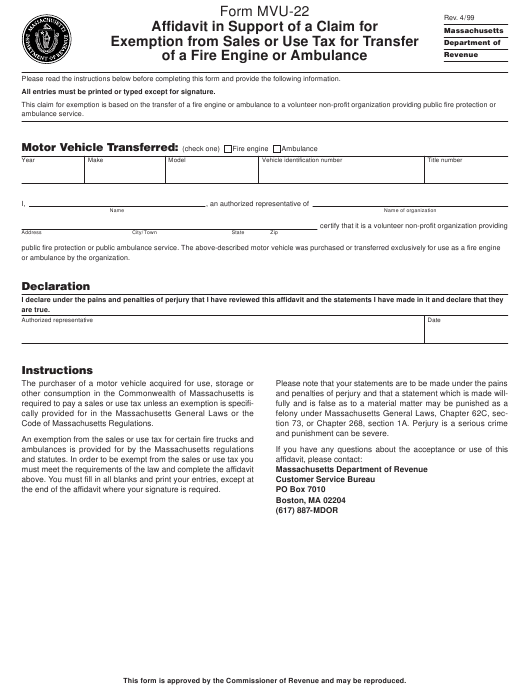 Download a PDF version of the Form MVU-22 down below or find it on the Massachusetts Department of Revenue Forms website. or ambulance by the organization. the end of the affidavit where your signature is required.